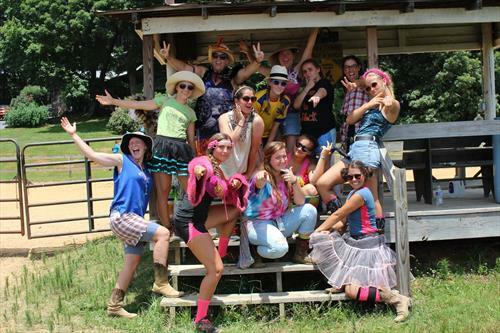 Looking for women ages 18 to 23 as summer camp counselors at an all-girls equestrian camp a'top the beautiful Lookout Mountain in Cloudland, GA. Applicants must be team players who love children, have a positive attitude, enjoy being outdoors, and are enthusiastic about horses! The main job is as a cabin counselor in a bunkhouse with girls ages 8-10, 11-12, 13-14, or 15-17. During the day, you will be supervising and teaching campers in the barn area during grooming, saddle-up, grazing and stall mucking. 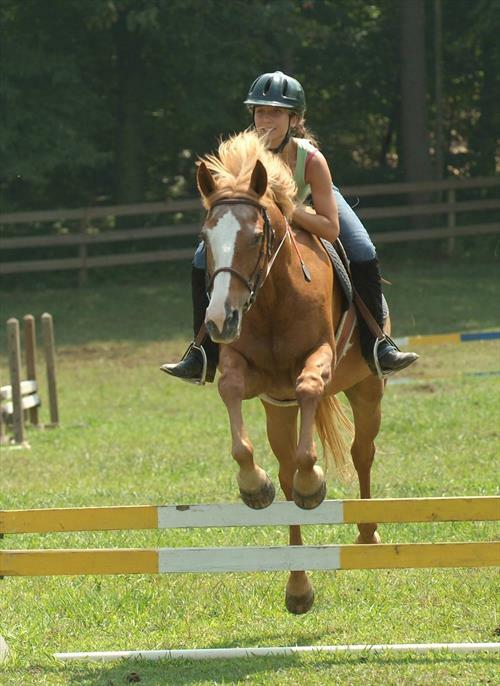 We teach English and Western riding, so you may have the opportunity to assist with lessons. You may also be asked to help lead and follow trail rides, with some opportunity to school some horses that need extra exercise in the ring. You will lead an afternoon activity such as kayaking, archery, crafts, hiking, dance (or whatever you are skilled at and like to do! ), and help run evening programs and games such as skit/talent night, bingo, campfires, and costume parades. We are much more focused on the memories made, the skills learned, and the connections gained with horses, nature, and friends than we are with competitions or winning blue ribbons. It is not absolutely necessary to be an experienced horsewoman to apply, as we do occasionally have the need for a craft or waterfront counselor to help manage those activities while the horse programs are going on, to help get the young ones out of the sun when the summer heat in the barn area gets to be too much for them. Counselors get one day off per week, and a weekly salary is negotiable. Accommodation and meals provided May 28th through July 26th. You will be living in a rustic cabin on the brow of Lookout Mountain overlooking Shinbone Valley with at least one other counselor and 6 to 12 girls in age ranges 8-10, 11-12, 13-14, or 15-17. Cabins have electricity and indoor plumbing. Wifi is available in ranch office during limited hours when you are off-duty. Meals are taken communally in a mess hall. Experience living and riding on a working horse ranch in the scenic beauty of Ancient Appalachia among an impressive herd of horses, and a great team of girls with a chance to make lifelong friendships! Accommodation and meals are provided. Opportunity to go white-water rafting on the Ocoee River or explore the nearby city of Chattanooga on camp trips once a session. 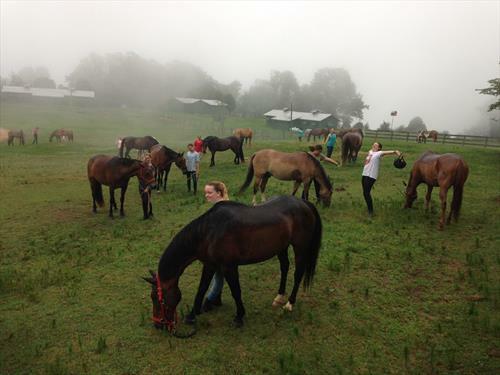 Valley View Ranch is a private equestrian summer camp for girls ages 8-17 located a'top scenic Lookout Mountain in Cloudland, GA. Each girl gets a horse of her own to ride & care for during her stay, anytime from 1 to 8 wks. 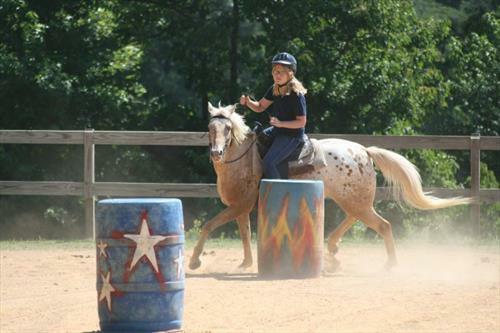 Campers take classes in western, barrel racing & gymkhana, & English "hunt seat" equitation & jumping. We have over 10 miles of beautifully wooded trails for riders to enjoy, & we also have a vaulting (gymnastics on horseback) program. Each girl gets the opportunity to participate in the daily life of a working horse ranch. Campers spend up to 6 hours in the saddle per day, & can participate in voluntary extra-curricular activities such as swimming & kayaking, archery, crafts, & dance. 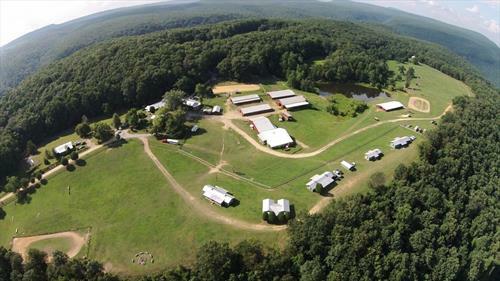 Campers are separated into bunkhouses according to age, & into riding classes according to ability. We have anywhere from 35 to 50 girls at a time, & our professional instructors & talented horses are capable of both schooling the most beginner riders & challenging the most advanced.